Capital Improvements & Repairs, Inc. In Orlando, house painting is something many homeowners and renters will take on themselves, but there are several, legitimate reasons to consider hiring a pro. The convenience and quality a professional has to offer your house painting projects is not something to dismiss. Even a small difference in the quality of your interior walls and exterior siding can have a profound effect on the look and feel of your home. Interior home painting is particularly dubious in some people's minds for farming the job out to the professionals, but others know painting is never as simple as it sounds. Trying to hit edges and corners with or without the help of tape or an edger isn't easy. Homeowners with limited mobility may have an excruciating time trying to paint bottom third of their walls and edge near the baseboard. Not only do the professionals' ability vastly outweigh your own, but they bring with them a unique set of painting skills. Murals, faux finishes, and other specialty painting techniques are all options that wouldn't otherwise be available to your home and walls. Professional painters are not interior decorators by trade, but they may still be willing to offer advice and lay out options for your home's interior. This is what one homeowner from Windemere told us about his $2,500 interior painting project, "Think out your color scheme and communicate with your professional. Ask for their advice and paint colors and types. It will pay off for you in terms of quality." Despite mild winters, intense solar radiation, oppressive temperatures, and the seasonal threat of tropical storms means Orlando homes see their fair share of abuse. Trying to find a paint product with high performance and eco-friendly without breaking the bank is not easy. The best paint for your home is also likely to depend on what siding material currently protects your home. It's notoriously difficult to get paint to last on vinyl siding for more than a few years. The window to get the project done may also be tough to thread, as summer storms, cyclical winds, and intermittent rains will regularly cause complications with exterior home painting projects. With exterior house painting, you also have a built-in advantage when looking at various contractors. This is what one Orlando homeowner said, who spent $3,000 on her paint job, "Go see other houses that the contractors have painted. It is very obvious very quickly which ones were done right." Many people suffer sticker shock when they first get estimates from Orlando home painters. The average cost of interior house painting is $2,100; the average cost of exterior house painting is $2,900. 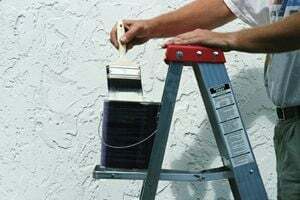 This may seem steep, but you should keep in mind this includes the cost of the paint and the painting supplies. Plus, there are several ways of bringing down the price of professional house painting. First, you need to look around; estimates can be wildly different. Many companies are willing to offer discounts if you move your own furniture and do some other basic prep. On the other hand, don't be too quick to seek out and hire the lowest bidder. The level of service, professionalism, and communication will also vary, even among reputable contractors, and you almost always get what you paid for. These factors, along with the inevitable variance in project size, has shown us projects ranging from just a few hundred dollars to four grand or more are not uncommon in the Orlando area. Generally speaking, it shouldn't take more than a day or twomaybe three or four at most for larger projectsto complete your house painting. This doesn't necessarily mean your project will be done the day after tomorrow, however, as the most popular Orlando house painters tend to have a full schedule and may take a little time to get time on their schedule. More than anything else, though, you need to make sure you find a reliable painter, and HomeAdvisor is on top of this mandate. Each and every contractor in our system has passed our rigorous ten-step screening process and must continue to maintain these professional credentials. At the same time, we compile a quality-controlled database of customer ratings and reviews so you can see what other Orlando homeowners have said about their experience with individual contractors. These reviews also create a powerful reason for contractors to ensure your own satisfaction with the job. Comment: I would like to get an estimate for painting my living room and dining room, eighteen foot ceilings. Comment: We would like to have our home repainted. Exterior of the home. Our house is a 1 story block home around 1400sqft. Orlando Painting Contractors are rated 4.76 out of 5 based on 1,825 reviews of 187 pros. Not Looking for Painting Contractors in Orlando, FL?